Getting to the Treasure Island beach area in Laguna Beach is not particularly easy. There are currently two ways for the average scuba diver to get to this dive site. The first way (recommended due to parking) is to get there via Aliso Beach. The second way to get there is via Victoria Street beach. 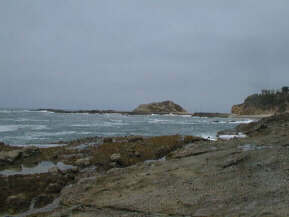 Both ways involve a serious amount of hiking along the sand and in some places the rocks. 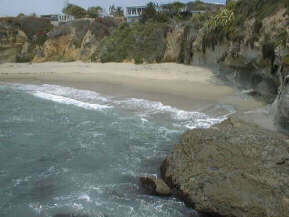 From Aliso Beach head west, just keep walking along the sand until you get to the rocks. From Victoria Street Beach head east, after a hike on the sand you will get to a private building that has rocks in front of it. You will have to cross the rocks (BE CAREFUL) to get to the Treasure Island Beach area. 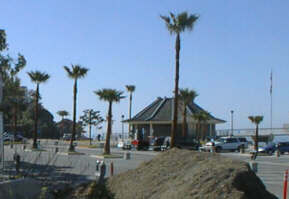 Parking for Treasure Island is best by using the parking lot at Aliso Beach. The parking is $1.00 per hour and you pay a machine the gives you a parking receipt that you put on the dash of your car. 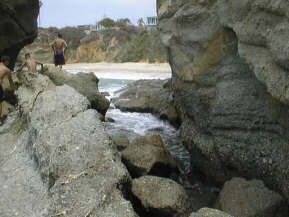 Beach Access via Aliso Beach is best done by going along the beach just before the rocks. Enter from the sandy beach just before the rocks and snorkel over to the beach area. I have tried the hike across the rocks (YES, with SCUBA!) and found it to be very difficult and dangerous! The wet suit catches on the rocks, the water water surge knocks you over, your tank bangs into the rocks, just do the snorkel. This is what you would be trying to get through if you get to the beach by going across the rocks. It is possible, but the passage way is very narrow and the water is rushing back and forth. The rocks here are slippery also. If you do decide to try this don't just rush in. Take your time and get a feeling for the waves first. Time your entry when the waves have subsided, then go slow and careful. Most importantly keep moving, if you hesitate the waves come back and try to knock you over. Facilities at Treasure Island Beach are the Beach, Only. At Aliso Beach there are bathrooms, showers, and when it's open a snack bar. You have plenty of parking available at Aliso. Diving at Treasure Island is in a small cove area that is just pas the rocks that border Treasure Island and Aliso Beach. 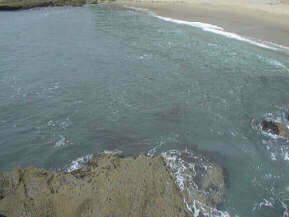 The water is shallow, 18 to 25 ft, and can be surgy. Since this area is such a pain to get to you won't find many divers going there. Because of this you can find fish that you might not other wise see. I have seen large halibut (4ft) and bass here. The first picture is of the beach at Treasure Island. This picture is from the rocks just above Treasure Island Beach. The picture shows how clear the water is, you can see the rocks and kelp in the cove even from above the water in some cases. This area is best when the water is calm and clear. 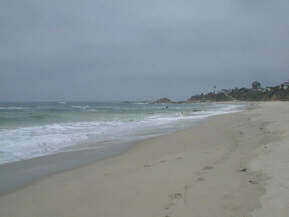 The conditions at Aliso beach can be used to judge the conditions at Treasure Island. Look for a day with NO waves and check with Laguna Sea Sports about the relative water clarity.